Sometimes it’s hard to stop the swell of painful, negative memories. 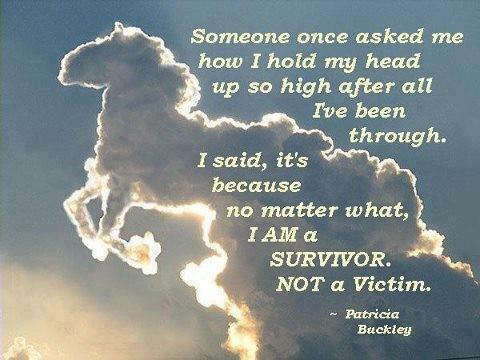 Don’t get me wrong…as early survivors, we NEED to dwell, think, and fight to understand what we just went through in order to process it and move on. It’s part of the healing process. There is no correct time limit for this part to be over, and every human processes things differently and in their own time. If it seems to be taking longer than your neighbor, don’t sweat it. When we are tired of rehashing everything, we will start trying to fill our thoughts and life with more wonderful, beautiful things. I found this online today, and it really touched something inside. Everyday we will continue to struggle out of the negative thoughts that fight for the fore-front. There again remains our choice to succumb or to be free today. This is a daily choice. Once the choice is made, then it’s up to us to fill the negative swell with something positive. We need to end each day with a pleasant thought. 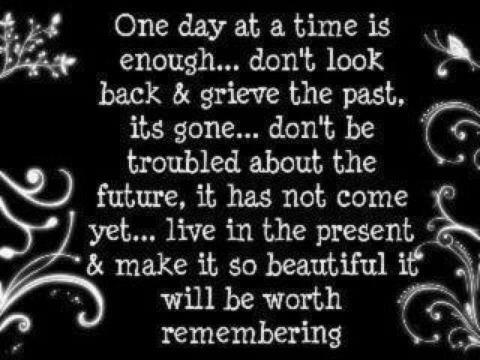 I love this: Live in the present and make it so beautiful, it will be worth remembering. We all need to find a way to make EVERY day beautiful in some way. How will you make today and each day beautiful? It can be in something you do. Spend the day with a friend you haven’t seen for quite some time. Smile at a stranger. Walk in the park. Do what makes you feel beautiful and blessed. You have to love the movie, “The 6th Sense”. It’s been the father of many “I see…” statements and jokes across the web. Most of those are funny. For me, it’s real life. No I don’t see “dead” people. Not really. But if you mean “dead” as in: dead in spirit, dead in emotion, dead in life, then I’ll have to agree…since without concrete emotion one’s life truly is dead, though that person might still be breathing. Those people truly are the losers in this life. It’s not that I can magically pick psychological abusers out of a crowd just by honing into their “vibes”, but I’m hyper-aware of the potential threat that is around me. I don’t know whether to thank (no I don’t appreciate this at all) my X-monster for this one because that is the embodiment of his paranoia that I picked up through conditioning, or blame him for causing this inside of me, due to his abuse. Either way, I told him point-blank that I would fight tooth and nail to keep from becoming him. I meant it. I looked him straight in the eye and with unmistakable contempt oozing from my soul. Yet, in this regard I have become like him. Paranoid of everyone around me. I see nothing but potential abusers and would-be Psychopaths. I love my new house. I appreciate the fact that I now have wonderful neighbors. The neighborhood is quiet and with a short walk, I can find a path in the woods. Perfect! Before I moved from that slime-pit, I spent every moment at home (especially when I was alone) with every lock on every door and window, locked. I would come home from work and instinctively lock the door behind me. It wasn’t because of the drug-addicts around me, or the drama…it was solely to keep my X, out. To keep him from getting to me. I was that afraid. I’ve moved, and have recently realized that I still have the same habit…locking every door. When I come home from work, I lock the back door behind me, before I ever walk away from it. I only walk in through the back door. The front door is just too exposed. When watering the lawn, I instinctively check the perimeter. I check across and down the street to make sure I won’t be seen. I’m stuck hiding from him, but not just him. I see him in every man I meet. Every man I see. Every man walking his dog, or riding his bike. New phases bring new battles. Hoping for a swift victory over this one.